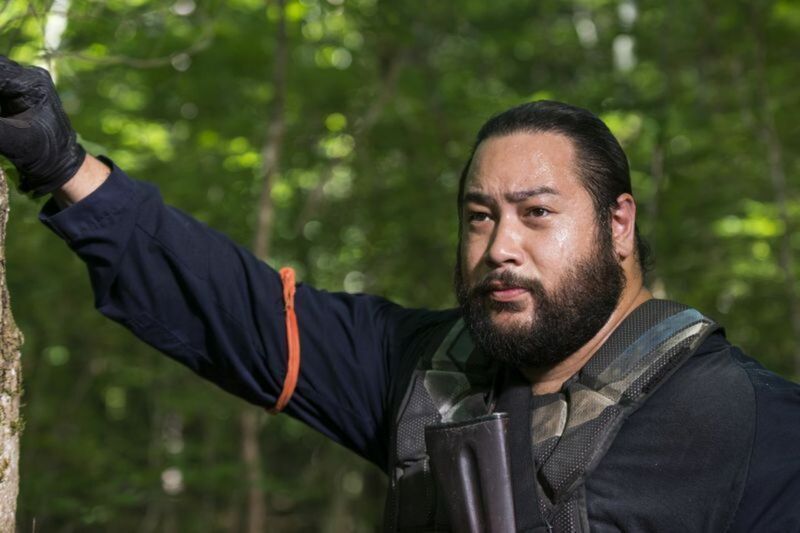 They promised an all-out war, and this week on The Walking Dead that’s exactly what we got. 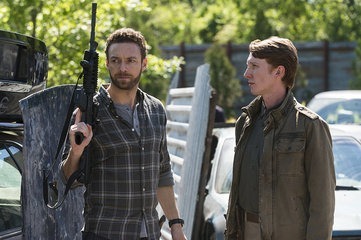 The episode follows four battles targeting the Saviors at their remote bases., the first a frontal assault on the Saviors led by Aaron, the second led by Ezekial and Carol, the third a more covert action led by Daryl and Rick and finally a party led by Jesus and Tara with Morgan as terminator support (more on that later). It’s never made fully clear what the objectives of these battles are with a few clues dropping here and there. Rick and Daryl are constantly asking about the guns, so I’m assuming they were after the armory. Jesus and Tara make a few mentions of medical supplies but that’s about it…I don’t think they were really talking about logical objectives in their production meetings it seems those meetings were more along the lines of “Just how many bullets CAN we fire in one episode?”. Don’t get me wrong, after sitting through multiple episode arcs where not a single violent thing happens I relish the action and though the entire episode seemed more like an extended second act of a premier or finale and episode like this was inevitable to really spell out the escalating tensions between these groups. Let’s get the bad stuff out of the way first. As a self-described action junkie I’m used to suspending disbelief when, say, Ahhnold fires 300 bullets without reloading or when James Bond kills 7 bad guys with 7 perfectly placed shots, that being said this episode really put those 80’s action films to shame…either that or it was a very cleaver homage. The biggest offender was the attack led by Aaron. They drive up in their Mad Max cars and immediately start firing, this goes on the entire episode. The two groups are not more than 25 yards from each other launching volley after volley of hot lead in all directions and only a handful of people go down…so much so that the battle is ultimately decided when the dead saviors start to turn Zombie and attack their former comrades. It becomes apparent that Aaron’s husband Eric is not going to make it through this battle sans holes and that ended up being true but not until the very end of the episode and even then, it was a single gut shot. I mean, this guy is running back and forth across this active war zone and it takes him 45 minutes to get hit. I get it, that’s the way Hollywood war works, but the thing is when you have a battle THIS BIG, you expect a certain percentage of casualties. I’m not saying a bunch of people have to die but they damn sure can’t walk out in as good a shape as they walked in! There is a LOT going on in this episode, so much so that I’m just going to focus on my two favorite aspects. Which, by the way, don’t include the random return of a 4th level character from season 1 (That’s Morales by the way…he was part of the group for a little while back in Atlanta just in case you were as confused as I was). First and foremost the diversity of action was just awesome. From Jerry’s surprising efficiency with a battle axe, to the covert ops and silenced pistols of Jesus (now there’s a line I never thought I’d write), right up to the full-on traditional gun battle in front of the armory. Under this action heading I have to mention the Morganator. That zen master of “All Life is Precious” is long gone, in his place is a cold killing machine who seems just a wee bit off. Morgan’s baddassery culminates in a heart dropping shot where it appears he was shot and killed. The he opens his eyes, gets up, and proceeds to calmly walk through the place headshot-ing every Savior that’s unlucky enough to cross his path. Next up is the zombies, as odd as it is to say I’m really glad the showrunners don’t skimp on the zombies even when their storylines veer so far away from the ghouls as the primary antagonist. You can REALLY tell the ones that turned at 0 hour. The level of decay is something past disgusting to the point that, even though it’s only TV, you can almost smell the gag-inducing aroma that must come along with something like that. 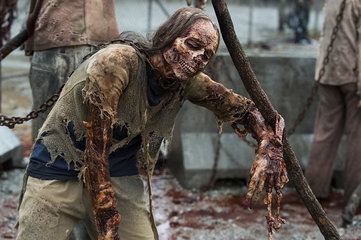 The variance of the different zombies is another high-point…it’s not just your standard dried up walking dead, there are zombies that have obviously spent a lot of time submerged, or hanging from trees. When you think about the design and practical effect time it takes to create these monsters it becomes more surprising that they still spend so much time and effort on them when they are not at the forefront of the episode or even season. No word from Father Gabriel of Negan this epsidoe, if I had to guess I’d say we won’t see them for another 1 to 2 weeks. Believe it or not even after 55 minutes of straight up action we still didn’t have everything wrapped up. It’s totally possible we jump right back into these battles next week. Until then!